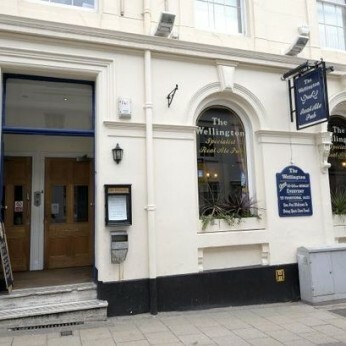 The Wellington is Birmingham's specialist real ale pub. Featuring 18 real ales, 5 traditional ciders & perries and over 150 whiskies. The Wellington opened in December 2004, realising a 10 year dream for landlord Nigel Barker. Having moved to Birmingham from Derby to run the Barton's Arms at Aston Nige was frustrated with the lack of availability and choice of real ales in the city centre and vowed, one day to open a real ale free house. It took some time but with the backing of Black Country Traditional Inns the Welly opened a week before Christmas 2004 with 10 hand pulls and a queue on the doorstep! It was an immediate success, so much so that within 6 months the bar had to be extended and another 6 hand pulls installed. In the first year the pub sold an unprecedented 2610 different ales. Due to the continued success, in 2014 the Welly, which had previously only occupied the ground floor and cellar of the building, acquired the former offices on the two floors above. A major refurbishment took place and in June of that year the pub re-opened with 27 hand pulls, an upstairs bar, function room and roof terrace. At the Wellington our main mission is to sell a large range of interesting, well kept real ales. We do, however, also have a range of quality lagers and ciders along with foreign bottled beers. Our range of Scotch whiskies on the ground floor is amazing whilst the first floor bar has a huge range of whiskies from around the world. We have recently introduced a range of speciality gins and rums. We don't sell food at the Welly but you are more than welcome to bring your own or order a takeaway curry, pizza or indeed anything to be delivered to the pub. We provide plates, cutlery and condiments. Do come and try our unique, music and fruit machine-free atmosphere. Unfortunately we only cater for over eighteens. The pub is situated in the heart of the business district and is less than 5 minutes walk from both New Street and Snow Hill Stations. Heading down to the Christmas market this weekend? Do pop in and see us! Whether you're all shopped out or just need a cosy break from the cold, we reckon you've earned yourself a festive tipple.